John Deere added a new compact wheel loader, compact track loader (CTL) and skid-steers to its lineup. It also launched its “Small Machines, Big Impact” contest. 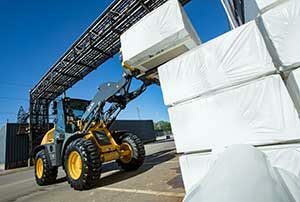 John Deere introduced the 344L compact wheel loader with Articulation Plus. The 344L offers a travel speed up to 25 mph with smooth auto-shift technology, a full-turn tip load of 12,650 pounds, reversing fan capabilities, proprietary shift logic and rim pull control. Its design features an articulated frame plus rear-wheel steer. According to the company, the Articulation Plus steering system on the 344L allows operators to lift more during turns, and the newly designed loader arms and coupler provide better parallel lifting of attachments and increased visibility, especially for operators using forks. The new cab design includes high-back seat, heating features, more space and increased visibility to the loader arm and bucket. It’s also equipped with pivot and rear oscillation. The FT4 Deere engine layout and cooling package provide increased airflow, reduced risk of debris penetration and easy access to ground-level service points. JDLink telematics is available on these models. John Deere also expanded its G-Series lineup of skid-steers and CTLs with the mid-frame 320G and 324G skid-steers and the 325G CTL. The new mid-frame models boast a 69- to 74-hp range and are capable of loading a 10-foot sidewall dump truck or hopper. The new models have the same pressurized cabs of their large-frame counterparts but are built with a smaller width and weight for contained job site areas. Cab enhancements include heated seats, Bluetooth radio, a rearview camera and an LED lighting package. A footwell cleanout simplifies debris management, and cab-side windows remove easily for cleaning. An in-cab boom lock-out system makes maintenance safer and more secure when the boom is raised. The new models include the Yanmar FT4 engine systems. Contractors can choose between standard manual foot and hand controls, ISO joystick controls switchable between ISO and H patterns and performance package options for adjusting drive system response, boom and bucket speeds or for setting creep mode on demand. 4G JDLink Ultimate machine monitoring is also available on these models. For John Deere’s “Small Machines, Big Impact” contest, contractors can enter through March 16 by submitting an entry detailing how they would make a positive difference in their communities if they were to win a new John Deere G-Series machine. John Deere will select a group of finalists, and public voting to determine the winner will take place June 4-24. The grand prize winner of the contest will be announced on July 9 at the 2018 John Deere Classic. 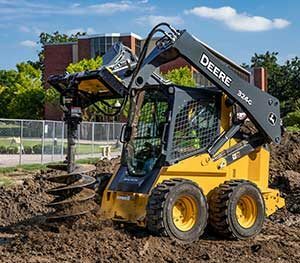 The entrant with the most impactful project idea will win his/her choice of a new John Deere G-Series skid-steer or CTL and one Worksite Pro attachment. Second- and third-place winners will win a yearlong lease on a G-Series skid steer or CTL from John Deere Financial.